I think it’s fun when I travel to a new place and find a connection I wasn’t expecting. That happened to me last fall when I visited Yorkshire. As I looked at a map to determine the route from York to the Farfield Mill Art & Heritage Centre in Sedbergh, I noticed that the drive could take me right through a town called Skipton. Skipton?! Where had I heard of Skipton? I wracked my brain, finally remembering that a pub in Skipton is where Alan and Celia met for the first time after connecting online, not having seen each other since they were teenagers. 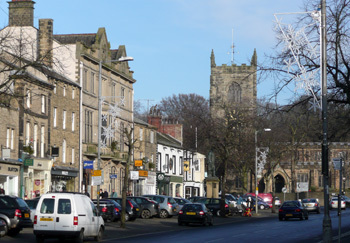 Both widowed and now in their 70s, they chose Skipton as a halfway point to meet, since Alan lived in Halifax and Celia in Harrogate. I think that meeting in Skipton took place on the first show of the first season of the delightful BBC series, “Last Tango in Halifax.” I won’t go into the details of the show itself, but basically it’s the story of high school sweethearts falling in love all over again – but with all the added complications you’d expect with grown children, grandchildren, health and money issues, and so on. You can visit the PBS site for more information or read a great review of the show on the blog Seniors for Living. As you may have guessed, I love this show. I’m also a huge fan of “Downton Abbey” and “Doc Martin” and most of the other great English series that appear on my PBS channel, Cleveland’s WVIZ. I embarrassed myself more than once on that trip by exclaiming enthusiastically to local Yorkshiremen and women, “Don’t you LOVE ‘Last Tango in Halifax?! !’ “ The story is set in the towns and countryside right where they LIVE, so it seems to me that most folks would at least know of its existence, right? Last what . . . ? I mean, if they decided to film a series called “Last Tango in Ashtabula,” I’m pretty sure everyone would know about it around here and be pretty excited, too. Maybe since England is geographically so small, the BBC is out and about filming things all the time and the people are just used to it. I do know that “Brideshead Revisited” and “All Creatures Great and Small” also were filmed in the area. So no, the people I accosted in York, Sedbergh and Skipton hadn’t heard of the show. While perfectly pleasant, they looked at me in bewilderment, apologizing for not knowing anything about this television show the Yank was all excited about. But anyway, my buddy Bernadette and I stopped in Skipton for lunch on the way to Sedbergh. 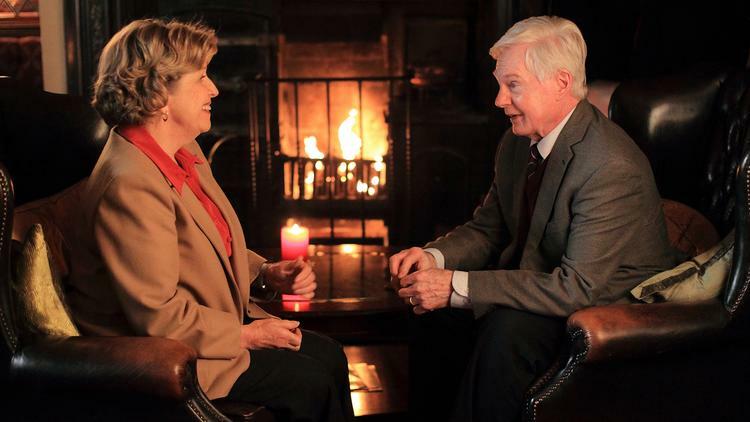 We sat at a table by the fire in a pub that was reminiscent of the one where Celia and Alan first became reacquainted. Though the couple just had tea or wine or something (it was evening and rainy and gloomy), they could just as easily have stayed for dinner and ordered pub food much like my lunch. Yummy fish and chips with . . . MUSHY PEAS! I was looking forward to my first-ever, quintessentially English pub lunch of fish and chips. Imagine my astonishment when the meal was served with a nasty surprise: a side order of mushy peas. That’s right. MUSHY PEAS. That’s the green blob on the plate. Apparently mushy peas are commonly served with fish and chips in England, although I can’t for the life of me imagine who would want to eat them. They are exactly what they claim to be: green peas mashed up into a vile green paste. I’m not sure they’re even seasoned. Why would anyone think it’s a good idea to take perfectly edible, innocent little peas and smash them to glue-like consistency to serve with nice crispy fried fish and French fries? Did someone think, hmm, let’s balance the crispy delicious fish and potatoes with something of a different and frighteningly disgusting consistency? Man. I just don’t get that at all. I’ve never understood how Australians could think serving baked beans on toast was an acceptable option for a light meal on a Sunday evening, either, but I digress. And how did I get to talking about food? Anyway, despite the mushy peas, I got a happy little kick out of eating lunch in Skipton. Believe me when I tell you, that’s the whole story. 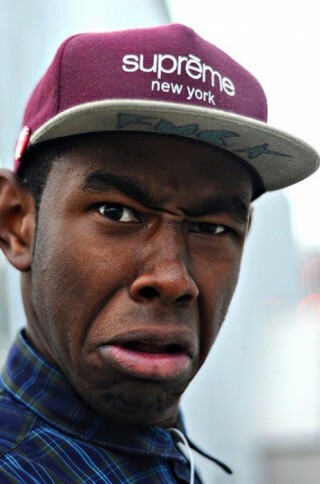 I didn’t meet Alan or Celia. Didn’t run into Gillian or Caroline or Kate. In fact, I’m not sure the cast ever had reason to return to Skipton in subsequent episodes. All I saw was the high street and road leading into town, so I can’t say I actually toured Skipton or anything like that. Having read more about it (see link above), I’m sorry I didn’t explore the market town beyond the borders of the pub. As it happens, it doesn’t take much to tickle my fancy. That may be why I have had no qualms about writing a blog, never worrying about what on earth I’d talk about from one week to the next. 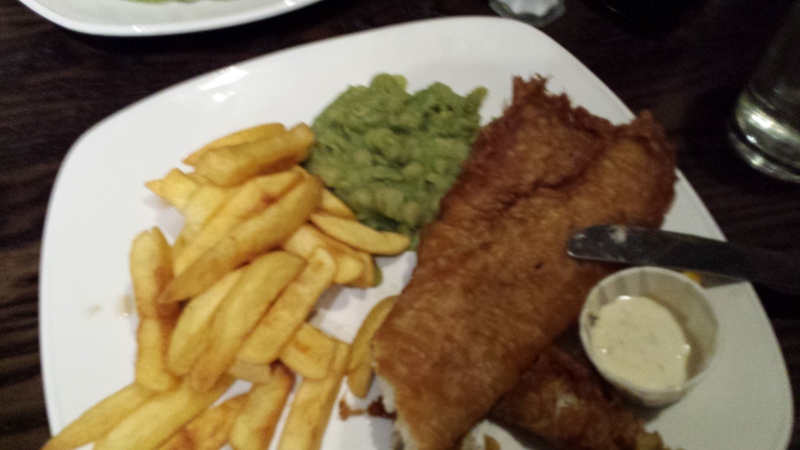 I had fish and chips and mushy peas in a pub in Skipton and it was a great day in Yorkshire. Yay! Now I can only hope you may be as easily amused by my stories . . . . This entry was posted in Travel and tagged BBC, England, Fish and Chips, Last Tango in Halifax, Mushy Peas, PBS, Skipton, WVIZ Cleveland, Yorkshire. Bookmark the permalink. You are such a card Kate. While I do not normally mash my peas I am going to give it a try. Green mash sounds good to me. I have tried watching Last Tango in Halifax but find all of those characters nuts. My cousin introduced me to the show thinking since I liked Downtown this would follow suite. No. Thanks, Deb! I would just like to add that “mushy peas” is what they call it, too. I did not make up that disparaging name. I normally like peas. i did NOT like them mushy (obviously)! Mushy peas are a delicacy. An American friend of mine always insists on calling them ‘Yorkshire Guacamole’. The traditional accompaniment is vinegar. In Lancashire there are market stalls that just sell mushy peas without the fish and chips. I love them! I would try it again with vinegar! Thanks for reading!